Hip dislocation is a major cause of complications after Total Hip Arthroplasty (THA), with reported prevalence rates ranging from 0.3 to 3% . According to the annual report of the Swedish hip register, dislocation was the second most common reason for revision, responsible for 25% of all reoperations within the first year after THA . Acetabular component alignment is considered to play a determinant role in THA dislocation . According to Lewinnek et al. the acetabular component should be placed within a 40° ± 10° inclination and a 15° ± 10° anteversion safety zone, inside which the greatest range of motion of the hip with the minimum dislocation risk should be achieved . The Anterior Pelvic Plane (APP) is defined as the plane through the right and left anterior superior iliac spines (R-ASIS and L-ASIS) and the Symphysis Pubis (SP) (Fig. 1b). Traditionally, the APP has been used as a reference plane for implantation of the acetabular component during non-navigated THA. The angle between the APP and the coronal (frontal) plane is defined as pelvic tilt angle (PT) (Fig. 1a). The PT angle can assume negative (anterior PT) and positive (posterior PT) values and it provides information about the spatial orientation of the pelvis. Fig. (1). (a) Pelvic tilt angle (αPT), defined as the angle between the APP and the gravity vector in upright position, and (b) Anterior Pelvic Plane (APP), defined as the plane through the right and left anterior superior iliac spines (1 and 2) and the symphysis pubis (3). Mayr and colleagues measured the APP of 120 patients in supine and upright position and calculated their PT angles. They found a mean PT angle of 5.6° in supine and 6.7° in upright position. The authors concluded that the APP in supine position is a valid reference for acetabular cup implantation, since in their study, mean PT angles were almost equal in both positions . In contrast, recent studies have shown significant PT differences between measurements performed in supine and upright position [6-9]. Therefore, the question whether PT angles measured in the supine position are adequate for acetabular cup alignment without an adjustment or without considering individual patient differences is highly relevant . 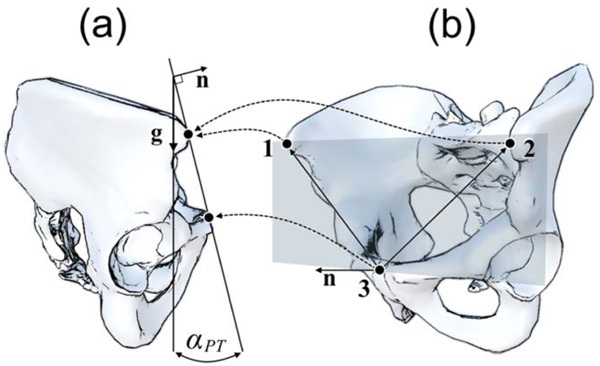 The accurate knowledge of the spatial orientation of the pelvis in an upright position is extremely important during acetabular cup implantation (mostly performed in supine position), because the pelvis position influences the final hip cup inclination and anteversion angles [6, 11, 12]. The inclination and anteversion angles have been advocated to influence the outcomes and survival rates in THA . In the past, malposition of the acetabular cup was related to higher dislocation rates, limb length discrepancy, femoroacetabular impingement, aseptic loosening and earlier revisions [3, 4, 14, 15]. In a study by Au et al. the pelvis of 30 THA patients was tilted more posteriorly in upright than supine position thus leading to a significant increase in acetabular cup anteversion and inclination (p< 0.001). Furthermore, the orientation of the acetabular cup was significantly more likely to be found outside the Lewinnek safe zone  in upright than in supine position (p< 0.001) . The functional orientation of the pelvis in different body positions also depends on the flexibility of the lumbar spine. Buckland et al. investigated the effect of lumbar spine fusion on the dislocation rates after THA and found that patients that previously underwent lumbar spinal fusion had increased rates of dislocation after THA . In view of the above-referred findings the data of two previous studies [17, 18] were treated in a secondary data analysis. The aim was to test for factors that significantly affect PT angles. Gender, physician, trial, body position, group affiliation (symptom free young subjects vs. hip arthritis patients scheduled for THA), age and BMI were used as independent factors. In this secondary data analysis a retrospective cohort comparison design was used. The data used for the present purpose was collected during two studies with the use of the same measurement system. One study investigated the intra- and inter-rater reliability of a navigated ultrasound system in the assessment of PT in Symptom-Free Young Subjects (SFYS) . The second study assessed PT in patients scheduled for THA . The data of the study with the SFYS was analyzed and published previously  and was now compared with the data of the patients scheduled for THA. In each publication a individual research question was investigated. The measurement system used for PT measurements in both studies is composed of a newly developed tracking software application that runs on a commercial smartphone (iPhone 6, Apple Inc., Cupertino, USA), referred further on as smart-localizer unit, two sets of reflective markers called “rigid bodies” for position tracking (Aesculap AG, Tuttlingen, Germany), a certified ultrasound device (Echo Blaster 128, Telemed, Vilnius, Lithuania) attached to a trackable 3-7 MHz linear ultrasound transducer with a sound window of 80 mm, and a commercial tablet (Microsoft Surface, Redmond, USA) as central unit. The tablet runs a custom-built software that enables communication with the other components and performs the necessary calculations (Fig. 2). The intra-rater reliability of the system when measuring PT angles was good to excellent and moderate to excellent for the supine and upright positions, respectively. Inter-rater reliability remained below expected values, probably due to the imaging protocols, which were probably still not described with enough detail . This system was chosen because it is noninvasive and offers a high degree of flexibility, since the tracking unit is held by hand, allowing the measurement of PT in different positions. 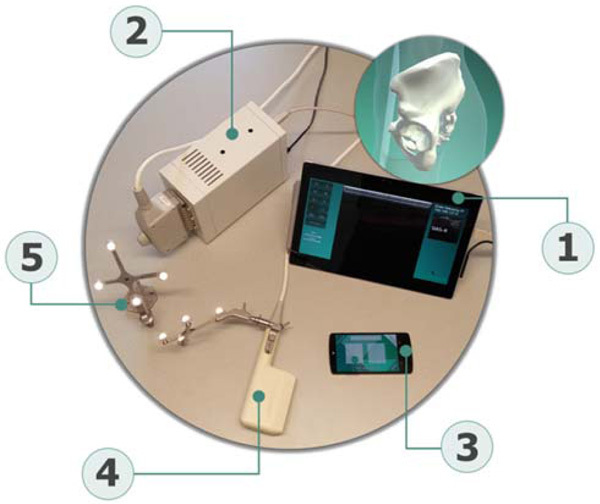 The alignment of the APP is computed based on the bony landmarks digitized with the use of the ultrasound transducer and the smart localizer unit. The ultrasound transducer is attached to a rigid body that allows the localizer to determine its position and orientation (Fig. 3). During the measurements, the operator records ultrasound images of the three bony landmarks that are necessary to define the APP (R-ASIS, L-ASIS, SP). Once the acquisition is complete, the operator has to identify the right position of the landmarks on each image. Using the position of the landmark in each image and the position of the probe during its acquisition (recorded by the localizer) the system computes the 3-dimensional coordinates of the landmarks and consequently the spatial position of the APP. The positions of the landmarks are computed in a reference coordinate system in association with a reference rigid body that remains stationary during the measurement. In the final step, the orientation of the APP is determined with respect to the gravity vector, obtained from the built-in inertial sensors of the smart localizer. The detailed description of the system and the algorithms used is presented in a previous publication . Fig. (2). Components of the measurement system: (1) central unit (Microsoft Surface, Redmond, USA), (2) Ultrasound device (Echo Blaster 128, Telemed, Vilnius, Lithuania), (3) handheld tracking system (iPhone 6), (4) ultrasound transducer with attached rigid body, (5) reference rigid body (Aesculap AG, Tuttlingen, Germany). Fig. (3). 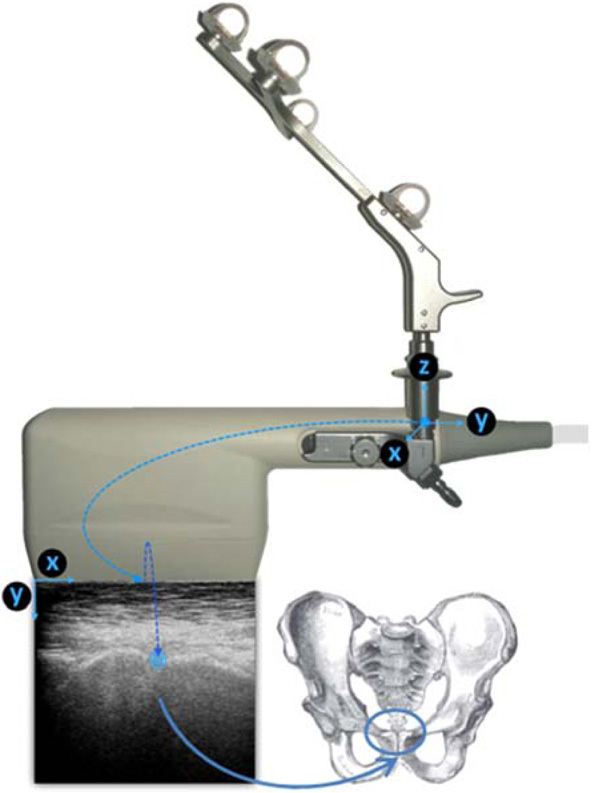 Ultrasound transducer with attached rigid body, enabling to receive the actual 3D position and orientation of the transducer, with the ultrasound picture of the symphysis pubis. The tracking unit does not need to be attached to a fixed tripod and can be held by hand, which offers a high degree of flexibility (Fig. 4). Due to this, the position of the tracking environment can be changed arbitrarily and unfavorable measuring positions can be easily circumvented. Fig. (4). Tracking unit, ultrasound transducer with attached rigid body and reference rigid body while tracking the L-ASIS in the supine position. Table 1. Demographic and pelvic tilt (PT) data. In both groups the transition from the supine into the upright position was associated with a significant mean PT increase. The mean PT increased by 8.1° (P< 0.001) and 21.4° (P< 0.001) with the transition from the supine into the upright position for the SFYS and patient, respectively. In supine position the mean PT of the SFYS was tilted anteriorly (-7.3° ± 5.7). In contrast, the mean PT of the patients was tilted posteriorly in the supine position (1.5° ± 17.3). In upright position the mean PT of the SFYS was nearly in neutral position (0.8° ± 8.1), while the pelvis of the patients was strongly posteriorly tilted (22.9° ± 20.2) (Fig. 5). Fig. (5). Mean (95% C.I.) 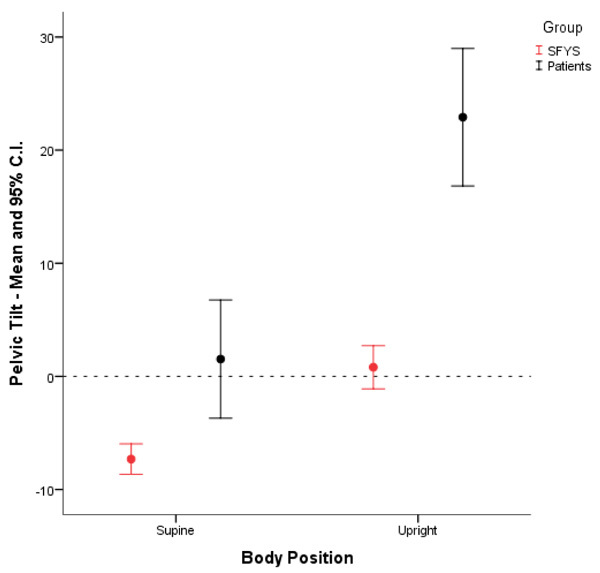 pelvic tilt values of the subjects in both groups (SFYS vs. patients) by body position. Negative PT value = anterior tilt, positive PT value = posterior tilt. Acetabular cup anteversion is affected by the pelvic orientation, particularly by the PT angle. While an anteriorly tilted pelvis increases, a posteriorly tilted pelvis decreases the anteversion angle of the cup . At the same time, the hip range of motion and the range of motion of the lumbar spine influence the degree of pelvic tilt too [9, 21]. Recently, Seagrave et al. presented a systematic review of studies that assessed the risk of dislocation after primary THA . Most of the included studies did not identify differences between dislocating and non-dislocating THA in regard to the mean cup anteversion and inclination angles. Furthermore, no significant reductions in dislocation rates were achieved in the studies where the acetabular cup was aligned within the Lewinnek’s safe zone. Another study concluded that the “historical target values” for acetabular cup inclination and anteversion may be useful but should not be considered a safe zone, since the majority of the THAs dislocated within those target values . In view of these findings the following question arises: why is the safety zone defined by Lewinnek not safe? The data presented in the present study provides a possible explanation: an acetabular cup aligned within the safe zone in supine position is not necessarily inside the safe zone in upright or in sitting position. The body position influenced PT significantly in both, young symptom free subjects and in patients scheduled for THA. Since the anteversion angle of the acetabular cup is significantly affected by PT, changes in body position may lead to instability and dislocation. This manuscript does not contain any individual person’s data. All data exposed in this manuscript was anonymized. The subject that is visible in Fig. (4) gave permission and signed an informed form for publication of the photo. Bourne RB, Mehin R. The dislocating hip: What to do, what to do. J Arthroplasty 2004; 19(4)(Suppl. 1): 111-4. Mayr E, Kessler O, Prassl A, Rachbauer F, Krismer M, Nogler M. The frontal pelvic plane provides a valid reference system for implantation of the acetabular cup: Spatial orientation of the pelvis in different positions. Acta Orthop 2005; 76(6): 848-53. Au J, Perriman DM, Neeman TM, Smith PN. Standing or supine x-rays after total hip replacement - when is the safe zone not safe? Hip Int 2014; 24(6): 616-23. Philippot R, Wegrzyn J, Farizon F, Fessy MH. Pelvic balance in sagittal and Lewinnek reference planes in the standing, supine and sitting positions. Orthop Traumatol Surg Res 2009; 95(1): 70-6. Pierrepont J, Hawdon G, Miles BP, et al. Variation in functional pelvic tilt in patients undergoing total hip arthroplasty. Bone Joint J 2017; 99-B(2): 184-91. Stephens A, Munir S, Shah S, Walter WL. The kinematic relationship between sitting and standing posture and pelvic inclination and its significance to cup positioning in total hip arthroplasty. Int Orthop 2015; 39(3): 383-8. Blondel B, Parratte S, Tropiano P, Pauly V, Aubaniac JM, Argenson JN. Pelvic tilt measurement before and after total hip arthroplasty. Orthop Traumatol Surg Res 2009; 95(8): 568-72. Zhu J, Wan Z, Dorr LD. Quantification of pelvic tilt in total hip arthroplasty. Clin Orthop Relat Res 2010; 468(2): 571-5. Barrack RL, Krempec JA, Clohisy JC, et al. Accuracy of acetabular component position in hip arthroplasty. J Bone Joint Surg Am 2013; 95(19): 1760-8. Kligman M, Michael H, Roffman M. The effect of abduction differences between cup and contralateral acetabular angle on polyethylene component wear. Orthopedics 2002; 25(1): 65-7. Parvizi J, Sharkey PF, Bissett GA, Rothman RH, Hozack WJ. Surgical treatment of limb-length discrepancy following total hip arthroplasty. J Bone Joint Surg Am 2003; 85-A(12): 2310-7. Buckland AJ, Puvanesarajah V, Vigdorchik J, et al. Dislocation of a primary total hip arthroplasty is more common in patients with a lumbar spinal fusion. Bone Joint J 2017; 99-B(5): 585-91. Kochman A, Goral A, Kozak J, Marek W, Morawska-Kochman M, Synder M. Preoperative Ultrasonographic Assessment of the Anterior Pelvic Plane for Personalized Total Hip Replacement. J Ultrasound Med 2018; 37(4): 949-58. Marques CJ, Martin T, Fiedler F, et al. Intra- and inter-rater reliability of navigated ultrasound in the assessment of pelvic tilt in symptom-free young adults. J Ultrasound Med 2018. Marques C, Martin T, Fiedler F, et al. The effects of body position on pelvic tilt angles measured with a smartphone-based navigated ultrasound system in symptom-free young adults. J Funct Morphol Kinesiology 2018; 3(1): 18. Kochman A, Goral A, Martin T, et al. Application of navigated ultrasound for assessment of the anterior pelvic plane in patients with degenerative hip diseases. J Ultrasound Med 2017; 36(7): 1373-80. Langston J, Pierrepont J, Gu Y, Shimmin A. Risk factors for increased sagittal pelvic motion causing unfavourable orientation of the acetabular component in patients undergoing total hip arthroplasty. Bone Joint J 2018; 100-B(7): 845-52. Seagrave KG, Troelsen A, Malchau H, Husted H, Gromov K. Acetabular cup position and risk of dislocation in primary total hip arthroplasty. Acta Orthop 2017; 88(1): 10-7. Abdel MP, von Roth P, Jennings MT, Hanssen AD, Pagnano MW. What safe zone? The vast majority of dislocated THAs are within the lewinnek safe zone for acetabular component position. Clin Orthop Relat Res 2016; 474(2): 386-91.